It's increasingly clear that sitting stationary for hours at a time is bad for you. But standing at your office's hip, new raised workspace solves that problem, right? 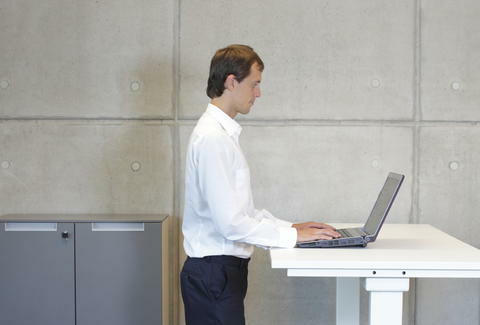 British researchers now claim that standing up is no better for you than sitting, according to a report by The Guardian. In fact, the study finds that sitting in itself -- whether at work or at home -- isn't what's bad for you. It's when you're in a stationary state for a long period of time that could negatively impact your health -- standing included. “Our study overturns current thinking on the health risks of sitting and indicates that the problem lies in the absence of movement rather than the time spent sitting itself," said Dr. Melvyn Hillsdon from Sport and Health Sciences at the University of Exeter in a press release. "Any stationary posture where energy expenditure is low may be detrimental to health, be it sitting or standing. The results cast doubt on the benefits of sit-stand work stations, which employers are increasingly providing to promote healthy working environments." Welp. Even though you may look cool and health-conscious among the slobs at your office, ditching your chair isn't enough. More activity throughout the day is needed. "Our findings suggest that reducing sitting time might not be quite as important for mortality risk as previously publicised and that encouraging people to be more active should still be a public health priority,” said lead author of the study, Dr. Richard Pulsford from Sport and Health Sciences at Exeter. The study, published in the International Journal of Epidemiology, followed more than 5,000 participants over the course of 16 years. But what about desks with a built-in spin bike? Where's the research on that? Tony Merevick is Cities News Editor at Thrillist and suddenly feels way less accomplished after standing at work lately. Send news tips to news@thrillist.com and follow him on Twitter @tonymerevick.